Posted: Wednesday, June 13, 2018 12:37 pm | Updated: 3:11 pm, Thu Jun 14, 2018. Ten CCSAR-N volunteers responded to the call at 10:47 p.m., Saturday to find Dan Dunham of Cape Coral, Fla., who was located via his cell phone on the south face of the mountain at about 12,800 feet above sea level. Dunham, 68, was visiting Colorado as part of an ambitious tour of the West packed with hikes intended to get himself back into shape. In the previous weeks, he had climbed mountains in Mount Zion National Park, Colorado National Monument, the Maroon Bells and a bit of the Continental Divide trail along Independence Pass. Only 4 or 5 days before his Princeton hike, he bagged Mount Elbert. 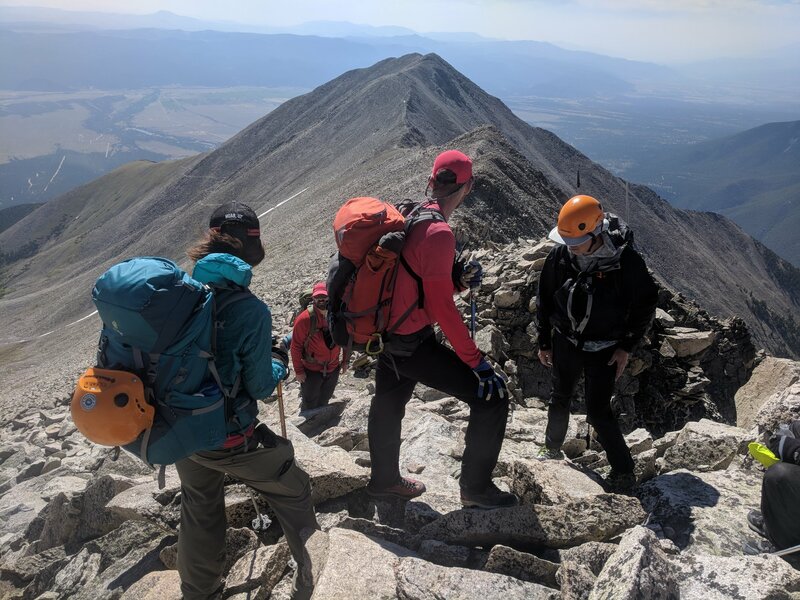 But summiting Mount Princeton in particular meant for Durham the completion of a trip over 20 years old, when a group of friends hiked several Colorado fourteeners in short order. Exhausted from summitting Mount of the Holy Cross in the days prior, the only mountain Dunham sat out during that trip while the others climbed was Mount Princeton. At nearly 69 years old, with diminished lung capacity from asthma and far away from Cape Coral, about 5 feet above sea level, it took Dunham longer than he anticipated, but he did summit Mount Princeton that day at around 3 p.m.
Trouble came on the way back down. In the scree above treeline, Dunham lost track of the trail. “There have been numerous CCSAR-N missions involving descending fourteener summits via the incorrect route” CCSAR-N wrote. Dunham said he descended about 900 feet, scraping his legs and tearing at his shorts while scrambling on the loose scree. He was determined to reach a small meadow he saw by nightfall. “It’s amazing how warm it can be during the day and how cold it can be at night,” Dunham said. He had several bottles of water and numerous energy bars, but had not anticipated spending the night on the mountain. Chagrined, he finally called 911. He gave the woman working dispatch the number of his sister to call if he didn’t make it down. “Don’t get ahead of things,” the dispatcher told him. The first obstacle CCSAR-N encountered was locating Dunham. They had some difficulty triangulating his location via his phone, and while he had a Magellan GPS unit, the coordinates were misinterpreted as being in decimal degree format rather than degrees, minutes and seconds. Once SAR realized his location, president Scott Anderson had to convince Dunham that he had to climb back up the mountain. Traveling down would land him in a canyon. “I was walking into a trap,” Dunham said. ‘He sent me a text that said you’ve gotta go back up the mountain … I said there’s no way. “I was really fighting for survival. I was tired, I was hurt, I didn’t have any energy left,” he said. At 4:15 a.m., two SAR members reached Dunham, shivering uncontrollably. Dunham said he remembered seeing the headlamps of the two men as they searched the mountain face for him. Lacking a headlamp of his own, he would periodically turn on the screen of his phone and wave it as a signal. They gave him extra clothes and gloves and “spent quite a bit of time convincing him that they had to go back up, as descending would be deadly,” the Facebook post said. On Monday, Dunham came to the offices of The Chaffee County Times to write a letter thanking Chaffee County Search and Rescue. His comments in this story came from a subsequent interview. His letter can be read in full with this story online. With the summer sun just below the horizon, beginning to slowly illuminate the sky, the two men methodically brought Dunham back up the mountain, one out front finding a route, one helping Dunham steady himself. A second team was sent up at 5:05 to assist the first. SAR reported that Dunham made it back to the trail at 9:05 Sunday morning. From there, the two men, who Dunham said were named Sam and Justin, turned Dunham over to the second team, who patiently helped him down the mountain, finally reaching the main trailhead at 2:15 in the afternoon. On June 9th I climbed Princeton Peak. I was the last one up there and somehow started down the wrong side possibly around 3 or 4 o’clock. As I headed down I realized I had made a mistake and tried to traverse to correct it but must have made things worse instead of better. I could see open field below me maybe 1000 or so and worked to get to the bottom but couldn’t make it before dark. The wind got colder and I only had shirts on (which by now were just about ripped off of me by the rocks.) Starting at 7:30 in the morning I NEVER expected to be up there after dark and did not take a flash light with me or long pants. After dark, freezing, I didn’t want to do it but called 911. The dispatcher woman was great. Her and another person (Scott) worked hard to pinpoint my location. They then turned things over to the Chafee County Search And Rescue Team. I’m not sure what time. Two men were in the field looking for me. Maybe around eleven. There was constant contact (as much as my dying cell phone would allow) between dispatch and myself to keep my hopes up. Those two men who ad been hiking up and down Princeton looking for me finally found me at 3am. I was physically exhausted and mentally dreamed, with uncontrollable shaking. They gave me a warm pair of pants, gloves, and then got me on my feet and marching back up the mountain. At first I told them I couldn’t go back up that mountain, but they said I had no choice. They urged and led me up that mountain about two steps at a time. They were unbelievably patient with me. One man picking the path and the other making sure I didn’t fall off the mountain. At times using his poles for me to hang onto to make it across shale or loose dirt. They finally got me back to the trail sometime in the morning (I wish I knew what time) and handed me over to another team who were just as spectacular. They were so patient, decent that I can’t believe it. I would not have made it down without either of these teams and the conduct, hard work, I cannot state enough was beyond amazing. Thank you. Thank you. Thank you. there really are no words that adequately state how grateful I am for what they all did, how good they were at it, and how incredibly good they treated me. This county truly has an amazing gift here with these people. The people at the dispatch center worked very hard to make this all work l also and I want to thank them at this time. – Dan Dunham, Cape Coral, Fla.